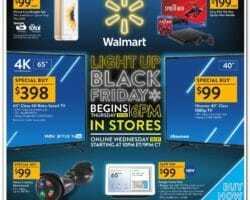 Browse the Walmart Weekly Ad Circular & Flyer Deals. Save with this week Walmart Ad, printable coupons, weekly circular prices, and current specials for appliances, electronics, furniture, apparel, toys, and more. Walmart is known as a super-savings store that carries a large selection of everything starting with groceries, office supplies, toys, baby products, clothing, jewelry, home improvement, sporting goods, and automotive. A one-stop destination, Walmart sells an extensive line of merchandise online and provides free in-store pickup and free 2-day shipping for lots of what they sell. The retailer runs discounts in all departments and carries various money savings opportunities. Items in the weekly advertising usually vary from organic foods and cleaning products to name brand cosmetics, baby items, tires, gaming consoles, televisions, fitness equipment, vacuum cleaners, furniture, plush toys and fragrances among many other items. Customers who shop at Walmart also save with coupons, value bundles, clearance sales, rollbacks and special buys every day. In addition, Walmart sells refurbished electronics with best prices for HDTVs, iPads, iPhones, Samsung tablets, HP notebooks and has free shipping and free store pickup for select buys.